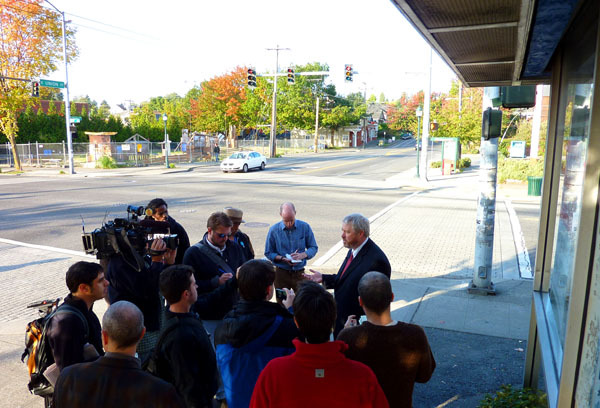 For eleven years I have lived two blocks from the notorious intersection of 23rd and Union where Mike McGinn recently held a press conference on public safety. We all know that the crime that has plagued the area around that intersection has little to do with the choice of Seattle’s Chief of Police, but hey, that’s politics. In contrast, over on the southwest corner of the intersection (left background in the photo above) is a missed opportunity that actually could have breathed some new life into the area. 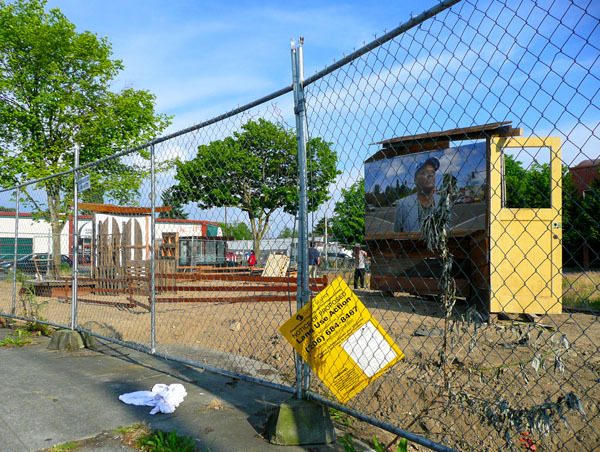 In 2007 a six-story mixed-use project was proposed for the vacant site, but since it was only zoned for only 40 feet, a contract rezone was required. This added a full year to the project schedule, and unfortunately that additional year happened to be a very bad one for banks—all the rules for financing changed, and the project has been shelved. Given that the proposed building was (a) exactly the kind of mixed-use infill project that Seattle needs more of to achieve its sustainability goals, and (b) a redevelopment trailblazer that could have brought catalytic, positive change to a chronically troubled corner, the question is: Why couldn’t the City have done more to help make the project happen, as opposed to effectively killing it by causing delay? The short answer is that it’s a bureaucracy, and has not been able to keep policy up to speed with the demands of a rapidly changing world. The longer answer is that Seattle as a whole continues to struggle with establishing and uniting around a bold vision for the more urban city it needs to become. The world is only going to change faster. Rapid growth in Seattle will continue for decades, and given that climate change impacts are likely to be more benign in the Pacific Northwest compared to much of the United States, it would not be unreasonable to expect significantly more growth than is currently projected. So how can we do better at encouraging the kind of development that will ensure Seattle’s growth plays out as an asset, rather than a liability? I’m envisioning an agency with the focused mission of (1) identifying the City’s highest priority areas for redevelopment, and (2) getting policy implemented that makes it happen. Actions might range from modest moves such as fast track permitting and upzones, to more substantial efforts such as land acquisition and the establishment of public-private partnerships, to major infrastructure improvements. To take one example, the Mt. Baker light rail station area is such an urban design disaster that redevelopment has stagnated for years even though the trains are now running. The critical action that must be taken to create a neighborhood center in which people would want to live is a remake of Rainier Avenue. Rainier rebuilt as a multi-lane boulevard would establish the heart of a new community, and redevelopment would follow. But what entity in Seattle is an influential force for making such a thing happen? I’m waiting. The promotion of smart development would likely be best served by a quasi-governmental organization like the Portland Development Commission or the Boston Redevelopment Authority. It says a lot that doesn’t Seattle have one of these. Or perhaps it could be a new City department, or it could grow out of the Planning Commission, or it could be part of some yet to be created fantasy such as the Office of Sustainable Urbanism. Seattle is well positioned to realize the potential of “MetroNation,” to use Bruce Katz’s term, but success isn’t going to fall into our laps. Posted by dan bertolet on	Thursday, October 15th, 2009 at 10:20 am. You can follow any responses to this entry through the RSS 2.0 feed. You can leave a response, or trackback from your own site. Everyday as I bike past that corner I’m saddened. I attended many of the planning meetings, and most the time I was simply besides myself at the comments coming from “concerned” neighbors. I guess they got what they wanted, an abandoned lot that encourages drug trafficking and ensures that I avoid 23rd and Union as much as possible. Devil’s advocate: Wouldn’t it have been better to do a 40-ft mixed use project that could have gotten off the ground faster? …or subsidized housing, which has not yet experienced a construction lag? 40 ft building wouldn’t happen. The building didn’t pencil out at 40 ft which is why the developer requested the contract exception. I assume the main issue is the city’s onerous parking requirements (which is approximately one spot per unit). Underground parking is expensive, between 40 – 80k per stall as I recall. Of course, even if the city had been willing to forgo the parking requirement there is little chance that any lender would finance a building of that size without parking. Once again, a worthy project killed by needless pro-automobile restrictions. There ought to be (and easily could be) exemptions for projects like this in areas highly served by transit, in this case the 2 and the 48, both of which run every 15-20 in the daytime. An appealing idea in theory. Won’t/can’t happen in Seattle. Fourty-foot buildings work all over the place if the land is bought right or the site is not perceived as a somewhat risky, pioneering one. Thank you City Comforts for clarity on this one. Re-zoning is not smart if the only purpose is to accommodate one developer. Re-zoning is first a city-wide issue, second a neighborhood/district issue, then third a specific site issue – not the other way around as some developers prefer to propose. Btw, Dan, I think that such a “SWAT of Development” goes against the last 40 years of land use law in Washington State and even more so, Seattle. Such a group would have to, at least, be able to exempt projects it likes from SEPA…or what else could “fast track permitting and upzones” possibly mean? I don’t think we are likely to see that happen. What Seattle needs is smarter and more sophisticated people and then the laws will change. So keep on working to change consciousness. City Comforts: There is a tool provided by GMA called “Planned Action”, in which environmental review for an entire sub-area (such as the Mt.Baker station area) is conducted, allowing subsequent projects to bypass this process (thus, “fast-tracking” them). I don’t believe it’s been used in Seattle, at least in recent history, though there have been some programmatic EIS’s in Northgate and South Lake Union. It requires upfront costs that can be prohibitive, but there are probably creative ways to mitigate those. @7 JAM: Why exactly do you see re-zones as city, neighborhood, and then site specific. I think it makes total sense for it to be exactly the opposite. Site specific rezones essentially require a developer to make their project attractive enough in other ways that neighbors are willing to give it extra height. If we just blanket rezone a neighborhood, or the city, there is the possibility of huge canyoned streets, or manhattanization, which is exactly what people are scared of. It also takes developers off the hook for public benefits as well as having the potential to very quickly increase density without the amenities. Not to say that the current system is perfect. I think Dan rightly points out that it is far too difficult and time-consuming to get any non-conforming project through DPD as it stands. I think some kind of performance based system would be great, and I love the idea of a Development authority that could target specific areas for better, faster development. And no doubt a more informed and intelligent public is needed that doesn’t just refuse height for the sake of it. But regardless I think tall buildings, and all buildings really, should be site specific. Thanks for the pointer. Indeed there may be legal ways to fast-track projects. But the history of land use in Seattle is so fraught with distrust, discord and sub-optimum zoning codes that I can’t conceive of such an area-wide exemption being politically-possible. Part of the problem is Seattle Land Use Codes which make it extremely difficult to forecasting impact (in terms of urban design, at least) with any accuracy. The only way an area-wide plan can work is if the code is very prescriptive, with very few development options on a parcel-by-parcel basis. The City will not make the investment in such fine-grain analysis and the citizens of Seattle don’t have the trust in planners (or their own ability to visualize the result of even simple codes) to allow reliance on the City government’s say so that “Don’t Worry. You will like the result of our plan when it is built out.” Does that one pass the smile test with you? So that’s why I am dubious. If you really want to know the root cause of the year it took to get appropropriate zoning, look at the failure of the city to fund ongoing neighborhood planning activities. The neighborhood plans are supposed to be living documents. Sure, if you are in a community with a lot of — to put it nicely — capacity, then updating the neighborhood plan is an expense that the locals can absorb. The 23rd and Union planning should have been re-addressed in 2004 IMO. Then the zonign would have made more sense to begin with. Don’t blame the bureaucracy, blame the neighbors and the public. This is an unfortunate situation. I like the idea of a “fast track” section that can move certain areas faster but unfortunately the city and the neighbors and public will all have to fight about what happens and when. While we may think it’s good to push certain areas through quickly, others will not.